1. August 2009. Qingdao is a truly beautiful Chinese city that consistently pops up in online articles ranking the Top Ten Cities In China For Foreigners. Seductively perched on China’s east coast, Qingdao offers decent beaches and is framed by several ranges of handsome mountains. Signal Hill Park (Xinhao Shan Park) is one of ten major hill parks in and around Qingdao. The park is set around an old German signaling station dating back to 1897 and you can enter the old observation tower, a rotating hexagon pavilion. It’s just 3RMB to get into the park, with an additional 10RMB for the tower. 2. August 2009. Looking for a cheap place to stay in Qingdao? There are a couple of fantastic hostels here that stand out as among the best I’ve stayed in across China. The Old Observatory Hostel is located atop Guangxianshan Park in the heart of the old German district. The hostel has been renovated from an old German observatory, which was built in 1904. 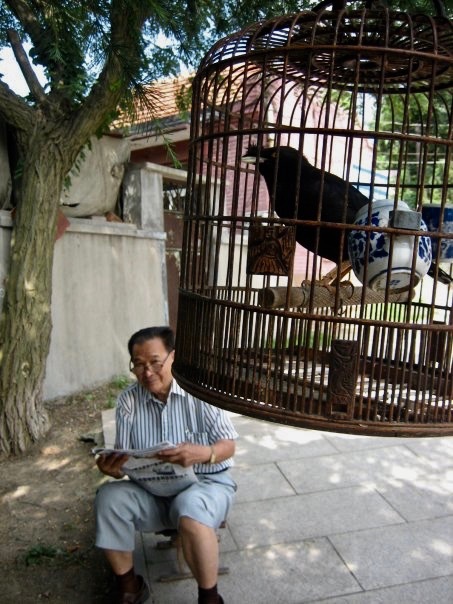 Expect decent food, more great Qingdao views and a pretty courtyard outside reception where old men gather in the morning to chat, play cards and read newspapers with their pet birds. 3. August 2009. 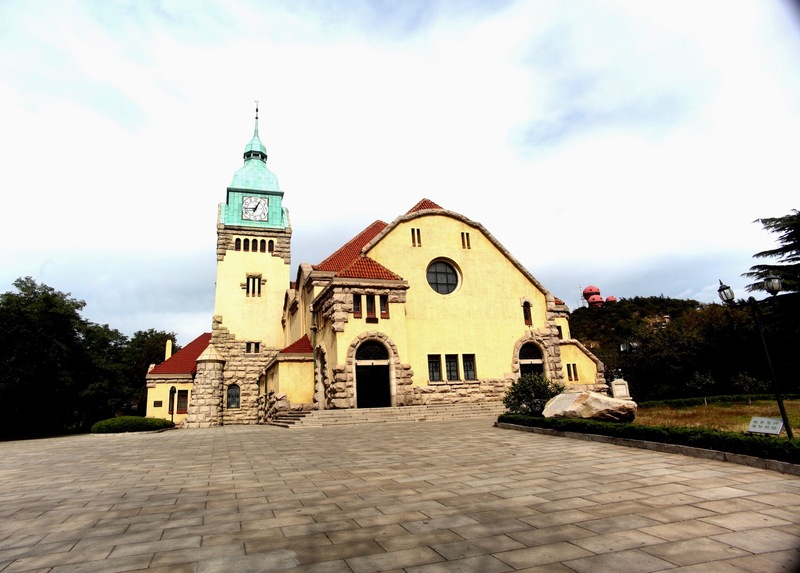 There are some beautiful European style churches in Qingdao. St. Michael’s (Qingdao Catholic Church) is the main draw, but this cute little Christian (Protestant) Church is also well worth a look. Built by German missionaries, this castle-like structure doesn’t seem to get much tourist action. So you should be able have the bell tower all to yourself and wander about in near-perfect peace. It’s open daily from 08:30-16:30 and is free to enter. Services are still held on Sundays. 4. August 2009. 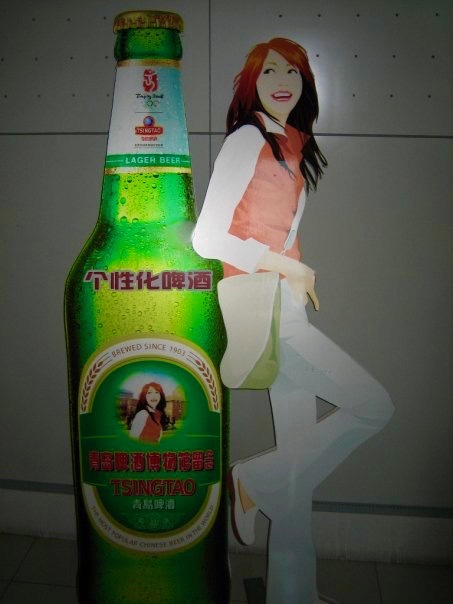 Qingdao is also famous for being the home of China’s most popular beer, Tsingtao. As such a visit to Qingdao Beer Museum (Tsingtao Brewery) is essential! Don’t expect too much and just have fun with it. You’ll be treated to bottle-top artwork and quality control laboratories with beer-swilling white-coated workers, as well as an amusing drunken house where visitors get pulled around by mysterious, magnetic forces. Entrance is priced at either 60RMB (July to September) or 50RMB (October to June). 5. August 2009. Once you’ve toured the brewery you’ll be perfectly placed on Qingdao’s so-called Beer Street (Dengzhou Road). This half-mile long road is positively packed with pubs, bars and restaurants specializing in local seafood. 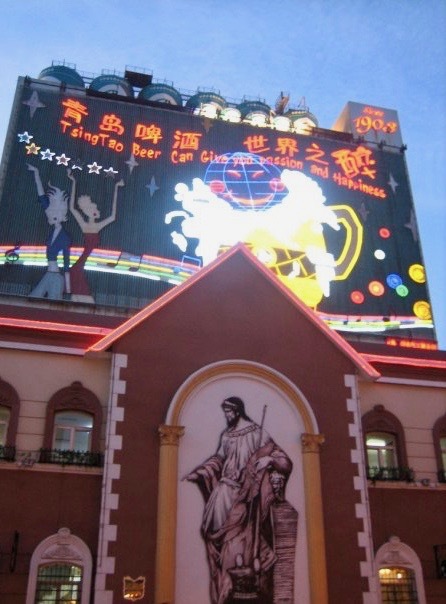 “The birth place of beer culture!” claims one dubious sign; “Tsingtao beer can give you passion and happiness!” states another above a painting of Jesus Christ. The road is mostly cobbled, European architecture prevails and the bins are shaped like beer barrels. Seek out those joints offering large mugs of icy-cold Tsingtaos for a wallet-friendly 10RMB. Like this? Take a peek at more My 5 travel reports from Qingdao. 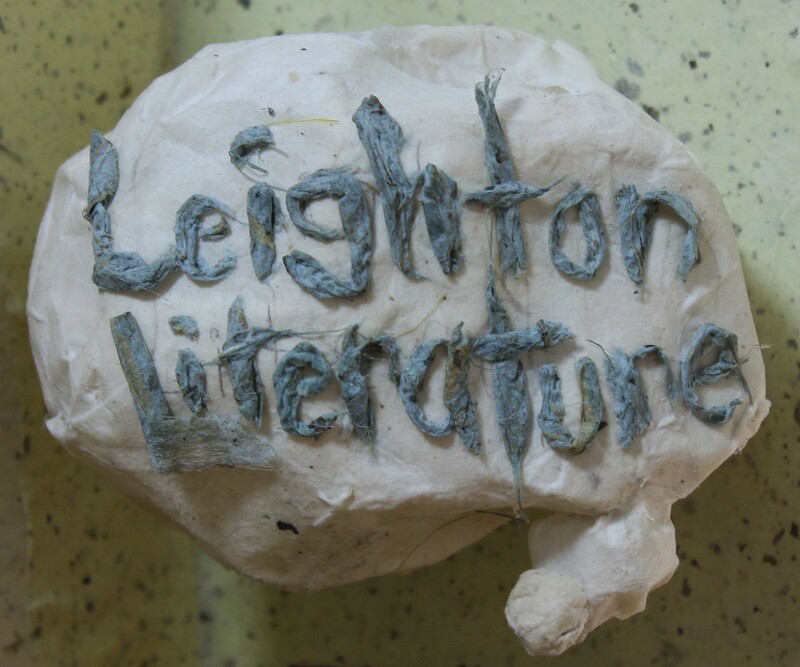 For a more personalized account of my time in this amazing Chinese city, check out my short stories Don’t Let Me Down and The Jellyfish Factor, taken from my series Challenged In China. I’ve travelled all over the country and written up an extensive army of My 5s, so why not dig into my travel guides from around China.